Hold an American wild west themed wedding: have a hillbilly hoedown! Home / Music Styles:- / American Country / Hold an American wild west themed wedding: have a hillbilly hoedown! If you have American family connections to celebrate and you’re searching for a wedding theme that is wildly entertaining, absolutely inclusive and vividly memorable, then why not look to the American Wild West for inspiration? Pull on your cowboy boots, don your Stetson hat and checked shirt, get out your kerchiefs and string ties and get ready for a real down-home night of American Country fun. 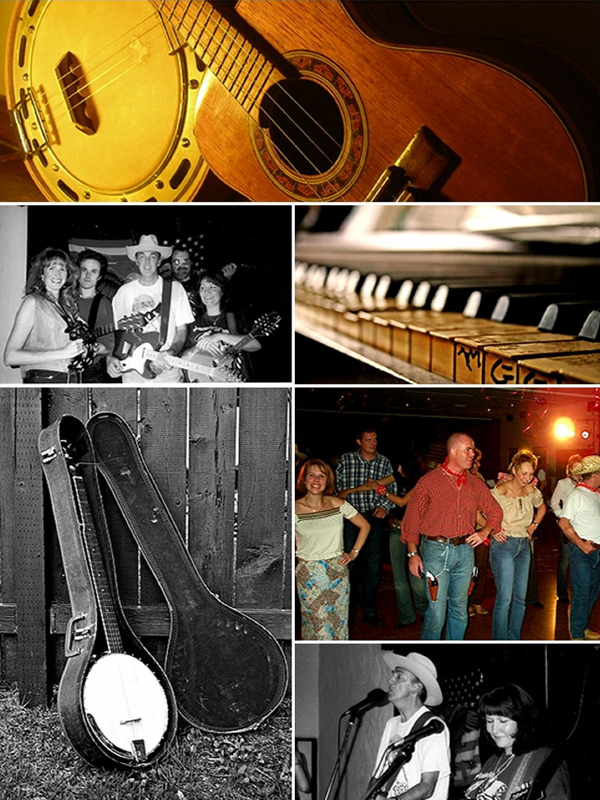 American Country and line-dancing bands for weddings. The American wedding theme immediately lends itself to a barnstorming hoedown as a riotous main event. An authentic American Country and Western band can really add to the hillbilly atmosphere. Frenetic bluegrass fiddle takes the lead, while tasty guitar, bass and drums keep the tunes joggin’ along. Look forward to the best of Rockabilly and Western Swing mixed in with jigs and reels, played Nashville-style. Fashion-wise, an American Country theme gives you the licence to evoke that Wild West cowboy look. Think Southern belle hooped gowns, slender tailored jean skirts for the gals and fancy detailed tuxedos or black cowboy jeans for the guys. Broad-brimmed Stetson hats and Spanish-heeled cowboy boots should, of course, be mandatory! A roof-raising line dance is a barnstorming way to get the evening wedding reception stomping. It’s a great way to involve all your guests on the dancefloor. No previous experience is required. A specialist teacher will show you all the steps and turns, and will adapt the routines to any ability level. In no time at all your guests will slapping their knees, throwing their cowboy hats in the air and whooping ‘n’ hollering with the best of them. An American Wild West theme can add a sense of adventure and individuality to a wedding, making it seem a little less formal and allowing your guests to express their creative side. A live Country band will get the evening rocking, hoedown style. Add to the mix some line dance instruction and you’ll soon have everyone stomping around the dancefloor in full hillbilly mode. Yeee-Haaa! !